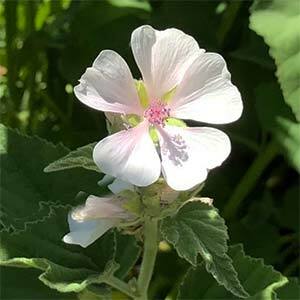 If you ever wonders where the name Mashmallow comes from its from Althaea officinalis, which is the Marshmallow plant. Although this is used as a garden plant, it does have a connection with the confectionary that we associate the common name with. History tells us that the Egyptians used the root of the plant to make a confection. It was also used in herbal medicine. Said to be useful in treating a number of complaints and infections, it is also grown as a garden plant. Given a moist well drained soil this is an easy plant to grow. Like the name suggests, it naturally grows in damp soils, although it will grow in any good soil. The method of propagation is from seed. Flowers – Creamy white with a touch of pink.